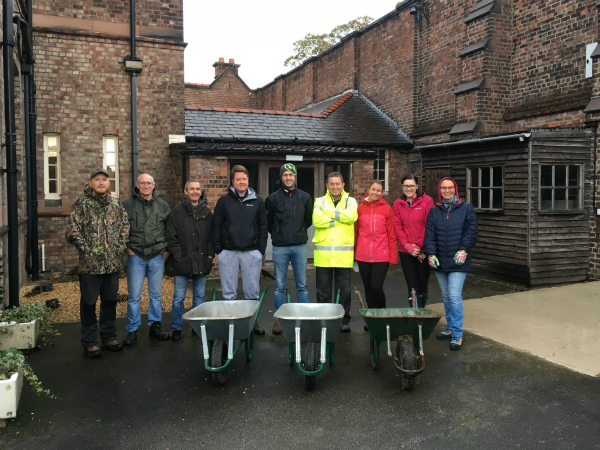 It wasn’t long ago that a group of volunteers from Manufacturing Product Integration had their marigolds on helping Claire House get their new house in order in Liverpool. Feeling inspired a team from MPP AME, MP&L and ST AME couldn’t resist rolling their sleeves up and joining the mission! Claire House Children’s Hospice, has set up a second home in West Derby at a former monastery. The four and a half acre site will give the charity a much-needed base in Liverpool, adding to their hospice in Bebington, which is already at capacity and difficult to reach for many parents. The team couldn’t resist a quick tour of the monastery after reading about it in People Talk Monthly and were impressed by the stunning features. They then started their clean-up mission which was a challenge as the weather gods were not smiling down on them! They didn’t let that stop them though and braced the cold, rainy conditions to help clean and tidy up the gardens. Well done to: Anna Marsh, Alexander Francey, Christopher Lamb, Colin Fletcher, Darren Stringer, James Strachen, Jennifer Reay and Laura Taylor.